Gout. I did not even know what the hell it was up until about three years ago. 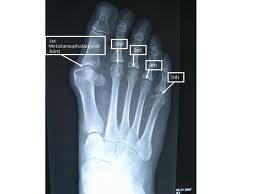 I suffered some pain in the big toe joint in my right foot. At first, I thought I had sprained it on my treadmill. I went to the doctor about it and he diagnosed me as having gout. I told him I had pain in my thumb joint in the previous two months also. I thought it was arthritis. He said it was probably gout. Gout is caused by high levels of uric acid in your body. I have been told it is due to a diet of red meat, red wine (this is a problem for me, I love red wine) cream sauces and I guess any rich protein diet will do it. The uric acid crystallizes in the joints. Trust me, you don't want that. However, once it is in your bone joints, it causes PAIN, swelling and inflammation. I'm dealing with all three right now in the big toe of my right foot. The pain slowly started last Monday. It has been so long since I had a gout attack, I had forgotten all about the pain of a gout attack. I can safely say I won't forget this gout attack any time soon. The gout pain has woken me up about 1:30-2:00AM the past two nights. I am not sleeping much. I do intend to call my doctor today to get an appointment if possible. The pain is extremely bad right now. It feels like when you are in pain, you are the only person in the world who is hurting. I have read the best thing to do is eat cherries, lots of cherries. I have also read where drinking orange juice will help also. I am not sure about that. It seems that orange juice would exacerbate the problem. This link does state it lowers uric acid levels though. Anyway, I hope this gout attack doesn't last much longer. I can barely walk. Hopefully, the doctor can prescribe something that will help me get past this pain of a gout attack soon. Thanks for sharing your experience. I also thank you for talking about the possible causes of gout. Dave, you are quite welcome and thanks for your cxomment.